Welcome to the St Cuthberts Of Bellingham page. I will paste here information from St Cuthberts as I get it. At present I have a small problem reproducing some photographs supplied with the text. I hope in the future to get around this technical glitch. I also have a" Friends Of St Cuthberts," application for membership form, which is a way that help with funding for the church can be given. See below if you would like to contribute. This year seems to have been one of scaffolding. My church in Newcastle was filled with scaffolding for several weeks in March, and then, on holiday in Istanbul and later in Barcelona, I encountered various buildings undergoing renovation or development with scaffolding creeping over them. And, of course, at St. Cuthbert’s the church has been shrouded in scaffolding while essential repairs to the roof were carried out, and for a time the congregation were given generous hospitality by our friends at St. Oswald’s. The over-riding theme of all of this is the importance of preserving our historic buildings so that we can use and enjoy them at their best, but also that they are preserved for future generations. Fortunately only rarely is major renovation necessary but regular maintenance must also be carried out so that we don’t lose the benefit of major works. Our churches are in many ways in a less satisfactory position financially than the buildings, gardens and areas of natural beauty maintained by the National Trust, and yet they are of at least equal importance. There is no comparable national charity for the, care and maintenance of historic churches. English Heritage lists buildings, including churches – St. Cuthbert’s is a Grade 1 listed building – but as far as churches are concerned it is a grant providing body. It doesn’t own and maintain churches in the way the National Trust owns and maintains properties. This means that support has on the whole to be found locally; and it is to help with this support, and therefore to help with the preservation of St. Cuthbert’s, that the Friends of St. Cuthbert’s was set up. So let me thank you for your continued membership of the Friends, and encourage you to join in the activities which are being planned for the months ahead. St Cuthbert’s, Bellingham played host to a facsimile of the Gospels in September. Along with the facsimile there was a ”Powerpoint” presentation, interpretative boards and recordings of monastic music creating an appropriate atmosphere. The Gospels are presumed to be the work of Eadfrith, who became Bishop of Lindisfarne in 698 and died in 721. The manuscripts contain the gospels of Matthew, Mark, Luke, and John. Richly illustrated, they were originally encased in a fine leather binding covered with jewels and metals. During the Viking raids on Lindisfarne this jewelled cover was lost. A replacement was made in 1852. About 250 years after the production of the book, the priest Aldred added an Old English translation between the lines of the Latin text, and recorded the names of the four men who helped contribute to its production, Eadfrith, Ethelwald, credited with binding it, Billfrith, an anchorite, with ornamenting the manuscript, and finally Aldred, himself, as the person who glossed it in Anglo-Saxon English. The carpet pages were probably influenced by early Coptic (Christian Egyptian) manuscripts in their resemblance to Islamic prayer rugs, which were probably known during this time in Northumbria. Similarly to the way that the mats helped worshippers prepare for prayer, the carpet pages can represent preparation of the reader before the Gospel message. Each carpet page contains a different image of a cross emphasizing the importance of the Christian religion and ecumenical relationship between churches. Why has such a great artist-scribe left part of the word Quoniam undecorated? Is it because he is so humble that he wants to show that only God can complete something to perfection? According to Aldred’s translation, the Gospels were made “in honour of God and Saint Cuthbert”. Scholars think that the manuscript was written sometime between Cuthbert’s death in 687 and Eadfrith’s death in 721. Due to Viking raids the monastic community left Lindisfarne around 875, taking with them Cuthbert’s body, relics, and books including the Lindisfarne Gospels. It is estimated that, after around seven years of moving through the north of England and South West Scotland, the Lindisfarne community settled in the Priory at Chester-le-Street in Durham where they stayed until 995 (where Aldred would have done his translation of the text). After Henry VIII ordered the Dissolution of the Monasteries in 1539, the manuscript was separated from the priory. In the early 17th century the Gospels were owned by Sir Robert Cotton (1571–1631) and in 1753 became part of the founding collections of the British Museum. As well as visits from members of the general public, some 250 local First and Middle school students had the opportunity to see the exhibition and participate in appropriate activities that came as part of an education pack. The Quinquennial Inspection three years ago noted that there was severe damp in the upper part of the Nave walls. After consultation with the church architect and English Heritage a programme of repair was devised. A number of estimates were sought and a contractor appointed who had estimated a cost of about £90k. After gaining a number of grants, particularly from English Heritage plus a very generous interest free loan, work started this July (at the time of writing £74k has been received or pledged). The work on the roof is now completed. Inside the church the damp plaster has been taken off exposing the stone work to allow the walls to dry out before re-plastering and decoration. It is estimated that this will take six to twelve months. While the walls are drying a new lighting system will be installed using the latest LED technology reducing power consumption. We are still applying for grants (to raise the remaining £16 000). An appeal letter has been delivered to all houses in Bellingham Parish. The interest free loan has yet to be repaid. Since the last Newsletter activities of The Friend’s have included the visit and talk by William Reddaway (Ride around England), a very good concert by Hexham Brass as part of the St Cuthbert’s weekend and a well supported Quiz at the Cheviot in October. At the time of writing no specific dates have been set but there are plans for a further Quiz in February or March and a concert by Antiphon, possibly in June. Also under discussion is the possibility of developing an “Activity Trail” in the churchyard, including digitising grave location. Bellingham Heritage Centre often has requests for information from visitors. The local Army Cadets are due to carry out a clearance of the lower churchyard with a view to re-instating the pathway down to the riverside. At my parish church in Jesmond, St George’s, we are installing new lighting, and cleaning the interior stonework, mosaic and tiles. For this purpose scaffolding has been erected, filling most of the interior of the building. For over two months the church has been virtually inaccessible and most services have been held in the church hall. This has caused many of us to reflect on what it would be like not to have a beautiful church in which to worship. These thoughts occur to me as I consider the aims of the Friends of St. Cuthbert’s church here in Bellingham. It is very easy to take our churches for granted; to expect that they will be there whenever we want to attend them – for a regular service, or perhaps for a wedding, a baptism or a funeral; to find a quiet place “where”, as T.S. Eliot has written, “prayer has been valid”, or just to look round. You will see elsewhere in this Newsletter that St. Cuthbert’s is seeking to raise over £30 000 towards the repair of the roof and improvement of the lighting. We, the Friends of St. Cuthbert’s, will be helping to raise money for this necessary work. But the Friends do not exist just to assist with immediate fund-raising, important though that is; the Friends have a long term commitment to the preservation and maintenance of the building so that future generations will be able to enjoy it. We are grateful for the support you are giving and we hope you will be able to enjoy and take part in the activities we are arranging for this summer and autumn. You will see details of these in the Newsletter. Please help to make these events as widely known as possible, and invite your family and friends to share in them. During 2013 Wlliam Reddaway is riding his horse Strider to the 4 corners of England visiting 30 Cathedrals, including all the medieval ones. He is expecting to be in the North Tyne for 3 days towards the end of June, when he will be about 650 miles into his 2,500 miles plus journey. Refreshments will be available. Tickets (at £5) can be booked through Rev. Dr Susan Ramsaran at the Rectory. Saturday 7th September will once again be the pilgrimage from St Cuthbert’s Elsdon via St Cuthbert’s Corsenside and finishing at St Cuthbert’s Bellingham. Scribed in honour of St Cuthbert in the early 8th Century, the original volume is on display in Durham this summer on loan from the British Library. 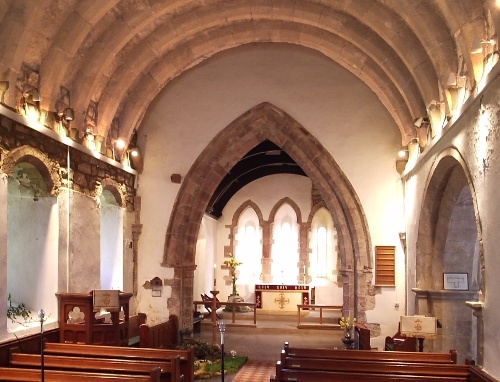 For the benefit of people in more remote areas of Northumberland, an official facsimile is to be exhibited in a few churches dedicated to St Cuthbert – including Bellingham. St Cuthbert’s, Bellinghamwill host the facsimile along with a “turn the page” slide-show, display boards and children’s material. Despite extensive restoration to the church in 1997 damp continues to be an ongoing issue. Scaffolding has been in place since January and some of the roof tiles have been removed to try and determine the extent of the problem. This was a preliminary investigation/inspection of the void between the internal and external roofs which revealed some unexpected conditions in the void. The internal roof appeared to be covered with roofing felt. An investigation into the archives indicated that during the early nineteen sixties the church was closed for a period while the internal roof was jacked-up, a coating of concrete was laid over the internal roof and finally the concrete was covered with roofing felt. to run down to the eaves. However, there appeared to be no way for the water to run into the gutters. The result is that any ingress water runs down onto the top of the walls and soaks in, hence the dampness and flaking of the internal plaster. The church architect, Dr Geoffrey Purves, and the English Heritage architect, Kevin Doonan, have agreed a procedure to address the problem and a contract for the work has been drawn up. We are now in a position where an approved contractor has been appointed but until there are sufficient funds the work cannot proceed. The estimated cost is £70 000 and the PCC is urgently applying to various funders for grants. To date we have a grant from English Heritage of £49 000 so there is a shortfall of £21 000. At the same time the PCC has concluded that the present light fittings need replacing. It is felt that this work should be done at the same time as the work on the roof in order that redecorating is only done once. This extra work is estimated to be in the order of £10 000 so, in fact, the PCC is seeking £31 000. Very peaceful – God is within. Stunning roof, incredible building, lovely village. It’s places like this that make this lost sheep want to return to the fold. The responsibility for the upkeep of the building attracts NO financial support from government or church authorities. 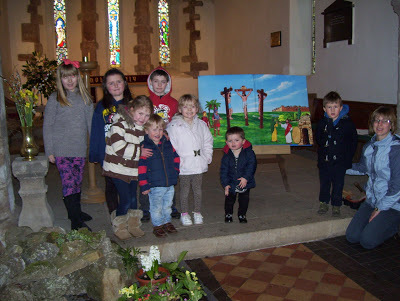 The church congregation already raises more than £12 000 a year to support the church’s ministry. The Friends scheme enables a wider group of people than the worshipping community to ensure that the building can be maintained for future generations. Maybe you were married, baptized or confirmed here. You may have celebrated the life of a family member in this church. Perhaps you lived in the village or attended church here when at Brownrigg School and have memories of your time here. As a Friend you will receive a periodic newsletter to keep you informed of activities which you may wish to participate in. Thank you for your support for St Cuthbert’s Bellingham. I would like to become a Friend of St Cuthbert’s, Bellingham and wish to pay my subscription as detailed below. If you would like to pay the subscription by Standing Order please complete the information below and we will send you the appropriate form. Surname ………………………………….. First Name ………………………………….. This site is for the use of ex pupils, staff and people connected with Brownrigg School, Bellingham. By visiting and adding content here, you will be recording for posterity, the life of a school that moulded the lives of some of the citizens of this country.